I don't know if you all are like this, too, but oftentimes I want to read ALL THE BOOKS at once. Which is an impossibility, as we're all fully aware. Alas, when I feel this manic need to read ALL THE THINGS and an inability to settle, that's when I'm inching up on slump territory. It takes a very careful, regimented approach to pick the next book to read. Essentially, I like to set up a "tasting menu." A selection of books from a variety of genres that might cover a variety of moods. I read 5-10 pages of each and see what "sticks." Giovanni's Room, by James Baldwin, which I started last weekend and like but haven't made much headway because I was finishing Hausfrau. Landline, by Rainbow Rowell, because she always seems to be a good idea when I'm slumpy. Out From Boneville, by Jeff Smith, because it's just stupid that I haven't read this series yet. Belzhar, by Meg Wolitzer, because I love Wolitzer, this looks like a quick read, and lots of bloggers I trust really loved it. Above Us Only Sky, by Michele Young-Stone, because it's pretty. 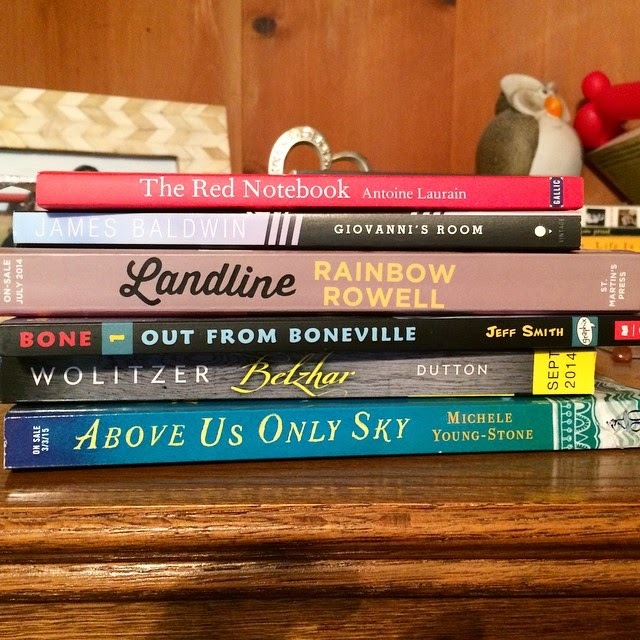 If I was a betting woman, I'd say I'll read Out From Boneville in one gulp today for #flashreadathon, and then I'll probably read a few pages of all of these and circle back to Giovanni's Room. That's my prediction. We'll see how it pans out! If you haven't jumped in on the #flashreadathon on Twitter, there's still time! I'm actually doing a similar thing as I picked up two e-books from the Free Library of Philadelphia and am giving each a taste before deciding. I might throw in another one or two too. I'm not sure. I can't seem to decide either. I tried the Bone series once, but I didn't get into it. I do know a lot of people like it, so maybe I'll try again sometime. I won't lie, though, I'm not a huge graphic novels fan either so that might be it too. Brilliant. That's exactly what we need....a plan to work through a possible book catastrophe. Let's see if your tasting menu idea works for me. Love this idea! Belzhar would be good, quick readathon book, but go where your heart takes you! What a fantastic idea! Although, I could see myself finding one I like and then just skipping the rest! What a lot of diverse choices. I read Giovanni's Room so long ago I'd forgotten it existed until I just read the title here. I think I'd pick something quicker, easier. I always want to read ALL the books and always feel so far behind. I didn't care for Belzhar, though my students really liked it. I love love love this idea - a tasting menu of books! It's just brilliant. I'm definitely going to borrow this - thanks, Andi! Nice quick reads - always a good idea, too, if you're inching up on a reading slump! Feeling a bit slumpy myself, in the middle of three separate 300+ pagers. I think I need to gather all the 200 or sub-200-page reads in my house and have my own impromptu taste test. Love this idea! I really liked Landline and I hope to read Belzhar soon. It is interesting how wanting to read everything can push one towards a slump. Sometimes there are just too many options and I can't keep myself focused on just one. I like the tasting menu idea, but i tend to prefer a full meal. I feel like this everyday! I had a short stack of things I wanted to read this weekend for #flashreadathon. I did manage to read The Castle of Otranto before one of my daughters talked the rest of the girls into a Gilmore Girls marathon and drug me right along with them. Back to reading soon, though! So now, the big question is, did you read Bone??? Girrrrl! Look at your new blog theme! It looks fab! Everything changed while I was away in India! I make myself a tasting menu absolutely every time I go to the library. It's my favorite thing about the library trip, coming back with a huge pile of books and trying out a few pages of every one of them. I love that you call it a "tasting menu" -- I'm going to start doing that too. Hah! I love the tasting menu idea! And I really must try Rainbow Rowell, I've heard so much praise. I have that. Most recent occurrence I just forced myself to read the one book and to keep remembering that the sooner I finished it the sooner I could read the next, rinse and repeat, and no television. I did also do the read a few pages thing, because I might want to read them all but some may not be right just now. I've done this with some of my super old TBR stacks and it's a great way to weed out books that no longer interest me. Of course, the last time I had a "tasting stack," I wound up with a bunch of books that I really wanted to read. Guess that's a good thing, right?